The Central Bank of Ireland has issued (4th April) their long-awaited centennial anniversary coins honoring the country’s 1916 Easter Rising event, which was a pivotal step toward the country’s eventual achievement of independence in 1922. The Rising, which saw its primary leaders lose their lives in support of independence, began on April 24, 1916, Easter Monday. Political activist Padriag Pearse (1879 – 1916) stood on the steps of Dublin’s Central Post Office and read out a proclamation of Irish independence. The words resonated with those who heard him and eventually became the cornerstone of Irish statehood. Soon after his heroic deed, Pearse was arrested and detained by British authorities along with fourteen other signatories of the Irish declaration of independence. He was taken to England where he was tried for treason and executed less than a month after reading those legendary words. He was honored by the Irish government in 1966 on the 50th anniversary of the event, when his likeness was included on a ten shilling silver coin. 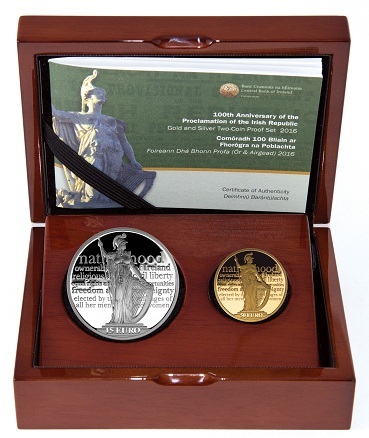 The coins, produced by BH Mayer Mint in Germany on behalf of the Central Bank, are issued in both gold and silver and designed by Michael Guilfoyle. The designs are identical on all three versions, with the exception of the inscribed denomination. 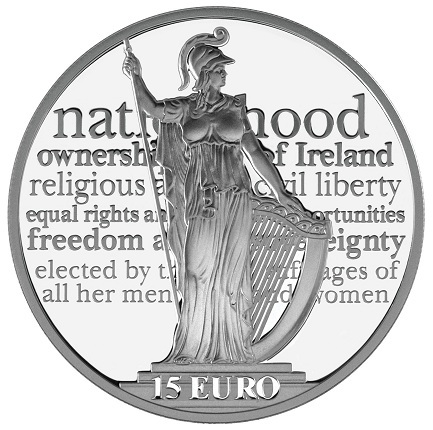 The obverse design includes the words read by Pearse in the background, along with a rendition of the allegorical figure of Hibernia, which stands atop the Central Post Office. 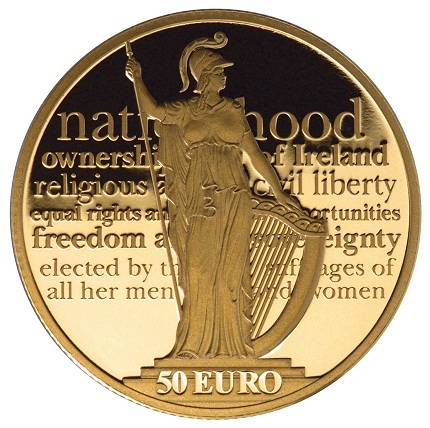 The reverse of the coins includes Ireland’s insignia, the harp, which is centered along with the text EIRE and the year of issue on either side along the edge. The coins are available in a variety of combinations of presentation. The silver coin is sold separately and as part of a two-coin set that also includes the €50 Proof coin. The gold coins are available separately. For more information on these and other coins offered by the Central Bank of Ireland, please visit their Web site. International orders will be dispatched where applicable. I am very proud to say I bought the gold proof and the $2 euro of these coins in honor of my Grandparents, for I may not have been born if it wasn’t the bravery of the Irish. This is very attractive looking coin to commemorate very important milestone / event in the history of Ireland. Could please advise the central bank to have e-shop to allow customers to place order and make payment online ? I believe they should do it sooner than later. Also, you usually come up with very comprehensive coverage of Irish coin issuing ceremonies, it missed on this occasion. I will be including the after-launch celebration which the Central Bank organised shortly – the issue of these coins were carried out a bit back-to-front this time owing to the need to issue the coins a little sooner than the planned official launch. I know they read my articles so – I have a feeling the department will take it under consideration, if they haven’t already. Unfortunately, I can confirm the €100 gold and two coin set sold out almost immediately with something of an over-subscription. The single €15 silver and €50 is still available.